With the WEMPE comfortmeter you get two products in one: a thermometer measures the temperature in °C and °F and the hygrometer measures the relative humidity in %. These measures are related and are an important indicator for weather conditions at sea. Even in closed rooms the comfortmeter is a useful instrument that not only brings marine flair to your living room. This instrument helps regulating a comfortable climate, as a higher level of humidity requires as drop in temperature. Who is comfortable with 30% humidity and 22.5°C will also feel good in 60% humidity and 21°C. 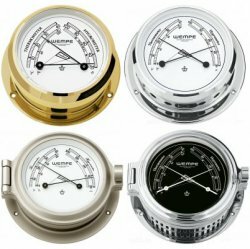 The assortment of WEMPE comfortmeters is broad: from entry-level model to the gold plated luxury instrument - we have them all. Choose your favourite design and trust 110 years of German quality craftsmanship.